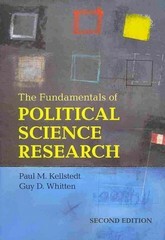 The Fundamentals of Political Science Research 2 Edition The Fundamentals of Political Science Research provides an introduction to the scientific study of politics. It offers the basic tools necessary for readers to become both critical consumers and beginning producers of scientific research on politics. Professors Kellstedt and Whitten present an integrated approach to research design and empirical analyses in which researchers can develop and test causal theories. The authors use examples from political science research that students will find interesting and inspiring, and that will help them understand key concepts. The book makes technical material accessible to students who might otherwise be intimidated by mathematical examples. This revised second edition refines discussions from the first edition, with a new chapter on how to write an original research project. The second edition also contains an additional forty exercises and adds definitions for terms discussed in each chapter.